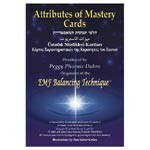 In this box you will find our first offering of 44 attributes of mastery, their definitions, and a booklet with simple instructions to assist as you PRACTICE mastery. I know you already possess these attributes of mastery, and many more. These cards are an invitation to encourage the expression of these attributes, and to increase your ability to co-create an enlightened life in accordance with your innermost, innate, and most wonderful wisdom. Think of what living in mastery means to you and PRACTICE. From the beginning of civilization, spiritual mastery has been surrounded in mystery and ceremony. Now the secret is out ... you can PRACTICE mastery in your everyday life!